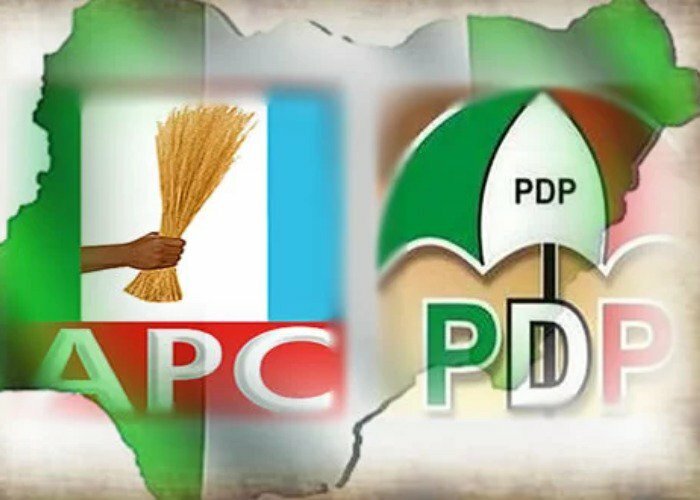 Fifteen ward chairmen of the Peoples Democratic Party (PDP) in Maiduguri Metropolitan Council of Borno State on Friday afternoon defected to the ruling All Progressives Congress,APC. The defectors created some air of confusion when they stormed Government House Maiduguri to declare their support for the ruling Party. The PDP officials’ defection came at a time the party is about to enter a crucial election in which two of their strongest candidates are vying for Senatorial and House of Reps seat in the same constituency. Maiduguri Metropolitan Council is one of the largest in Borno state. Apart from being the state capital, it is also a federal constituency, as well as the largest voting centre within Borno Central senatorial district. The outgoing Borno state governor, Kashim Shettima, is the APC candidate for Borno Central, and he is going to face a former occupant of the seat, Senator Muhammed Abba Aji, as the candidate of the PDP. The 15 defecting ward chairmen said they were leaving the PDP because the party has not offered them any convincing argument that it would do better than what the ruling APC had done for the state in the past 3 years and nine months. Kabiru Babagana, the chairman of Bolori II Ward spoke on behalf of the 15 ward chairmen. “We the 15 ward chairmen and our secretaries have decided to leave the PDP because the leadership has always failed us when it comes to times election,” said Mr Babagana. “Besides, the ruling APC has done so much for Borno state since 2015. The APC controlled federal government has not only helped us to decimate Boko Haram but also helped to rebuild our schools, hospitals and markets. Another speaker, Mukhtar Sheriff, who is the chairman Mafoni Ward said they left the party because the government in Borno state has left them with no option. “We are humbled by the achievements of governor Kashim Shettima, who despite our state of insecurity has done his best to keep our state running,” said Mr. Sheriff. “And we have decided to join him and his Governorship candidate so that we can all build a better Borno state. The defectors were received by the current member of the federal House of Representatives, Kadiri Rahis, who is also a candidate. Mr Rahis said the governor appreciated their decision to join the party even as he urged them to come out en masse to vote for the party. He also advised them to vote quietly and avoid any act of violence. Efforts to get a reaction from the PDP state secretary, Baba Ahmed wasn’t successful as his phone could not be reached at the time of filing this report.